In September 1941, young Jack Kennedy was appointed an Ensign in the U.S. Naval Reserve. After completing training and eager to serve, he volunteered for combat duty in the Pacific and was appointed commander of PT 109. On August 2, 1943, Kennedy's PT 109 and two others were on a night mission to ambush an enemy supply convoy when they were surprised by a massive Japanese destroyer. The unsuspecting Americans had only seconds to react as the Japanese captain turned his ship to ram directly into Kennedy's. PT 109 was cut in half by the collision, killing two of Kennedy's 12 crewmen and wounding several others in the explosion. While many young readers have heard of President John F. Kennedy, few know about anything other than his assassination. 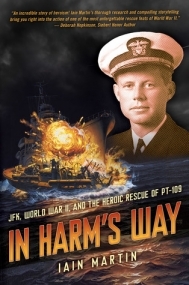 While this book concentrates on the events surrounding Kennedy's war time service and the aftermath of the enemy attack on the PT boat he was commanding, it gives a nice overview of Kennedy's family and life both before and after this, and discusses the ramifications of Kennedy's military service and injuries on his political career. Illustrated with annotated period photographs that add personality and perspective to the narrative, this book helpfully fills in information that young readers will not already have. The "Kennedy Family Scrapbook" insets are especially enlightening, discussing (in a positive way) the family dynamics, lifestyle, and expectations. The Pacific Theater is not as well covered as the European Theater, so maps, photographs of the scenery, and discussions of key players and events are helpful in placing the use of the PT boats. The real draw is, of course, the harrowing adventure of the PT boat being hit by enemy fire and cut in half. Kennedy and some of the crew survived the initial attack, but the real test was being stranded in the water and then struggling to an island, hoping all the time to elude the notice of the Japanese. Grit, determination, and a lot of sheer luck contributed to the survival of Kennedy and several of his men, but the horrific conditions caused several others to perish before being rescued. Kennedy's return and an overview of the rest of his life round out the book nicely. Readers who enjoy a good survival story like Olson's Lost in the Pacific, 1942: Not a Drop to Drink, Spradlin's Into the Killing Seas, or those with an interest in Kennedy or biographies of other World War II luminaries will appreciate this updated and sanitized look at a pivotal occurrence in the life of one of the 20th century's most admired men.